Note: For basic freemounting instruction, please click here. There are countless ways of getting on your unicycle. Mounts are fun to learn, and they can look really impressive! Note: it's easier to learn these mounts if you see them done first! Standard Mount: For the standard mount, sit on the seat and put your foot on the upper pedal. Hoist yourself onto the other pedal without rolling backwards and take off forwards. Reverse Mount: Start with your foot on the lower pedals and step down on the it so the wheel rolls underneath you. Idle backwards, then go forwards. This is the mount we learned first, and therefore it's the easiest one for us! Side Mount: This looks cool, kind of like getting onto a bicycle. (Wow, that word looks strange, doesn't it? We never use that word!) Start on the side of the uni, with your left foot on the left pedal (or right foot on right pedal). First, concentrate on balancing on the pedal for a little bit. Then, work on bringing your other leg through, between the foot on the pedal and the frame of the uni. Finally, try to swing your leg over the seat, hit the other pedal, and ride away! It doesn't take very long to learn this one. Side Mount from floor: This is a variation of the side mount - it's not that much different! Start with your foot on the corresponding pedal and lean the uni down until the other pedal touches the floor. Then side mount! It helps us to remember to keep the seat back farther than you think. Reverse Side Mount: Just like side mount, only swing your leg around back of the seat instead of around the front. Side Mount to wheel walk: This is another variation. Instead of your second foot going to the other pedal, place your foot immediately on the tire and then wheel walk out of it. Jump Mount: The good news - it's completely a mental thing. The bad news - it's completely a mental thing. The jump mount is NOT difficult - it just takes guts! (That's why it took us awhile to get it! But we did, and so can you.) Hold the uni out in front of you by the seat. Make sure the pedals are level, horizontal. All you have to do is jump, nail the pedals, sit down on the seat, and ride away. It might help to use a wall or something at first. Or, if you have access to a B.C. wheel, that really helped us work up the courage to jump onto pedals. The B.C. wheel is just a wheel with free-rotating pedals, so we found it easier to try jumping on that first without worrying about the seat post. 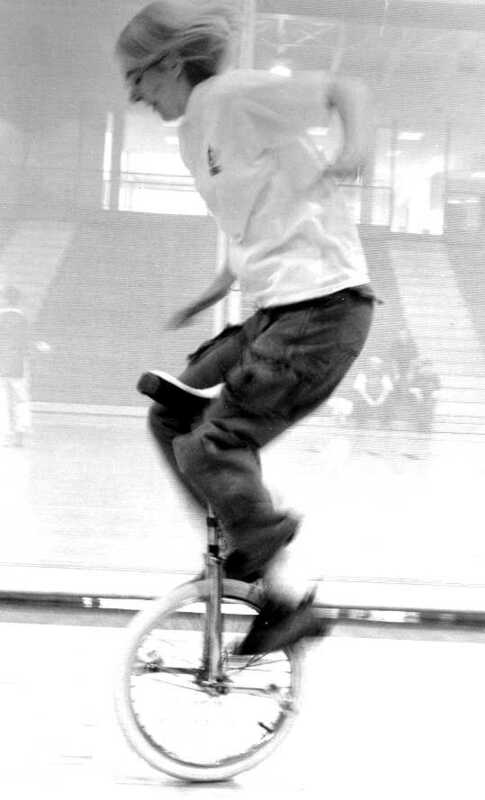 Then try a unicycle - a 20" is probably less intimidating but we can also do it on 24". It's a very satisfying feeling when you get it!! Right, Tammy demonstrates the suicide mount (aka free jump mount). Notice how no part of her is touching the uni! Ahh! Suicide Mount: This is just like the jump mount, but you let go of the seat right before you jump. Just keep telling yourself it's the same thing! Don't worry about balancing the seat perfectly before you let go - it doesn't work. Set it so that if it falls one direction, it will fall back toward you. You can still get on. Rolling Mount: For this mount, walk or run behind the uni, pushing it along, then hit the pedal as it comes around and mount it without the pedals stopping. Hit the pedal as it starts to come out of its lowest point, and the momentum will scoop you up. It looks pretty cool, plus it is helpful for mounting a bigger unicycle, like a 28" or a 36". Back Mount: Start with the seat under you, but the tire behind you. It's the opposite of the reverse mount. Push down on the pedal that's in front, so that the wheel rolls under you. Once you get your other foot on the pedal, it's easiest to idle before pedaling away. One-Foot Reverse Mount: Start in the position for the reverse mount, but when the wheel rolls underneath you, place your second foot on the frame rather than the pedal. We suggest you first learn one-footed idling. Once you're good enough at that, you can ride away after one reverse idle! One-Foot Rolling Mount: Walk or slowly run with the uni, then when the pedal comes around, put your first foot on it. The other foot doesn't touch the uni at all - you can swing it forward as you mount to keep your momentum going. The important thing is to get the frame up over the wheel. You can try one-foot roll-mounting by placing the second foot on the frame first, to get a feel for it. Mount to Wheel Walk from one pedal: Start in the position for the standard mount, with one foot on the back pedal. Then, bring your other foot right up to the tire and follow it with the other foot. Wheel walk away! Make sure you don't rock backward first - go immediately forward, or pause for a second with your foot on the tire and then go foward. Mount to seat-in-front: You can do this either standard or reverse. First, learn to ride seat-in-front and idling in this position helps also. Practice on a slightly downhill slant to make things easier. Hold the seat very steady, with your strong hand, and keep it close to your body. Mount to seat-on-side: Start with one foot on either side of the tire, with the seat close to your side. For example, right pedal down, seat on your left side. Step on the down pedal, idle once if you need to, and start riding seat-on-side! You can also do these mounts with your opposite foot. There are tons more, which we will add after we master them!